The following guide walks you through the steps of uninstalling Microsoft's Internet Explorer 8 web browser from a Windows PC. Microsoft has released Internet Explorer 8 some time ago and has started to distribute the new browser version using the operating system's built-in update services. Windows users who run an older version of Internet Explorer, IE6 or IE7 specifically, will receive the update if they have Windows Update enabled on the Windows system. While the web browser does run fine on most computer systems it can - like any other software - cause problems on some. We published methods to uninstall Internet Explorer 8 manually a while ago. Doing so allows you to go back to a previous version of the browser available before on the computer system. For most users this is an easy and straightforward process as Internet Explorer 8 can be removed from the programs list in the Windows Control Panel. Only Windows XP users who have installed the third service pack for the operating system before Internet Explorer 8 are not able to uninstall the web browser unless they uninstall the service pack 3 before as well. 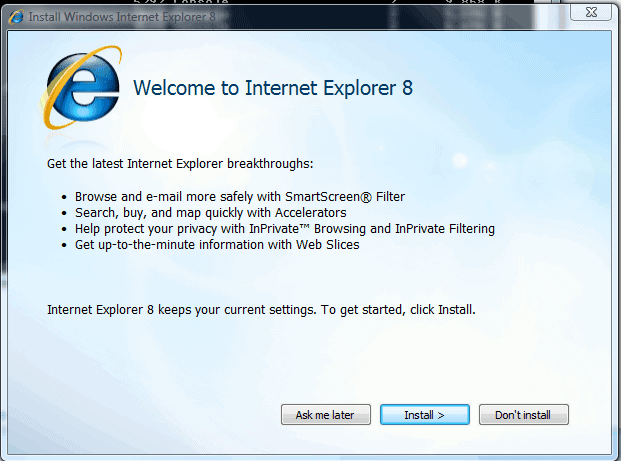 Microsoft has created a script to remove Internet Explorer 8 automatically from a PC where it is installed on. The script is available as part of Microsoft's Fix It initiative which tries to provide one click solutions to common problems on the Windows platform. Update: The Fix It solution is no longer available. Microsoft has removed the resource from the company website; downloads are no longer provided. The file UninstallIE8.msi can be executed right from the Microsoft website or by downloading it to a local computers system and running it from there. Please note that it is generally not a good idea to remove Internet Explorer 8 unless it is causing issues on a computer system. Even on systems where Internet Explorer is not used actively by users, it is recommended to install the most recent version of the browser as its engine may be used by other programs as well. Note that it will not work on Windows 7 or newer versions of Windows. Update: Similar options are available for uninstalling Internet Explorer 9. You can check out our guide to find out how you can remove the version of the browser from your Windows system again should the need arise. Note that you can disable Internet Explorer 8 on Windows 7 but not completely remove it from the system as it is the default system browser that has been tightly integrated into the operating system by Microsoft. The article takes a look at a new tool released by Microsoft that enables Windows users to uninstall Internet Explorer 8 from Windows PCs.